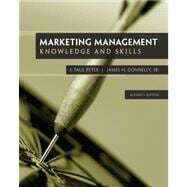 Marketing Management, 11e, is a text and casebook written by Peter and Donnelly. It is praised in the market for its organization, format, clarity, brevity and flexibility. The goal of this text is to enhance students' knowledge of marketing management and to advance their skills in developing successful marketing strategies. The six stage learning approach is the focus text. Each section has as its objective either knowledge enhancement or skill development, or both. The framework and structure of the book is integrated throughout the sections of the new edition. The basic structure of the text continues to evolve and expand with numerous updates and revisions throughout. Case 3: South Delaware Coors, Inc.
Case 5: Coach, Inc.: Is Its Advantage in Luxury Handbags Sustainable? Case 8: Your Home is a Good Place, Inc.
Case 18: The Challenges Facing eBay in 2008: Time for a Change in Strategy? Case 4: Gap Inc. in 2010: Is the Turnaround Strategy Working? Case 10: Dell Inc. in 2008: Can It Overtake Hewlett-Packard as the Worldwide Leader in Personal Computers?